Hollybeary Creations : Your Next Stamp October Release Sneak!! Your Next Stamp October Release Sneak!! Happy Wednesday everyone... Are you ready for the October Release from Your Next Stamp? All of the new products will be available in the store tomorrow morning at 11am est. In the meantime, the Design Team and Guest are sharing a peek at some of the new products. 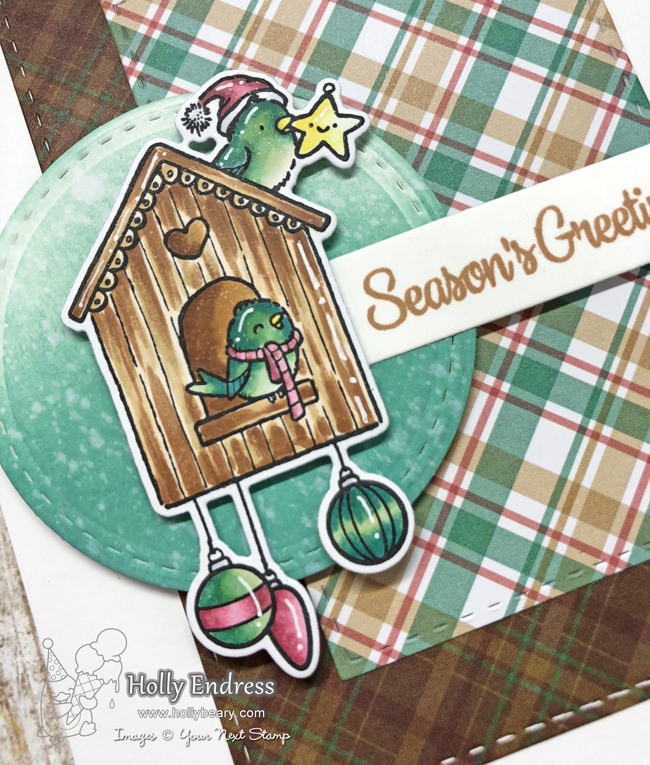 I'm sharing a peek a the new Mint Cocoa Kisses 6x6 Paper Pad and the adorable Home for the Holidays Stamp and Coordinating die set. I started with an A2 size card base and then I added some of the Pattern papers that I die cut with the Stitched Rectangle Die set. Then I die cut a circle from some Watercolor paper using the Circles and Stitching Marks Circle Die sets. I added some Evergreen Bough Distress Oxide Ink and then I adhered it to the card front with some foam tape. I stamped the Birdhouse image onto some X-Press It blending cardstock with Black Olive ink and then I colored it in with Copics. I used the coordinating die to cut the image out and I adhered it with some foam tape. I die cut a banner with the Fishtail/Banner One die set and stamped the sentiment in Almond Latte Ink. Then I tucked it behind the birdhouse image. Head over to the Your Next Stamp blog for more sneaks and be sure to join us back here at 11am est tomorrow for the New Release Blog Hop! Such pretty patterned paper. The dangling ornaments are so pretty on the birdhouse. Good job on your lovely creation. Love your little birdhouse, your colouring is fab too! love the way you colored the birdhouse!